Here's one of my favorite traditional Catskill dry flies, the Red Quill. It imitates the male Hendrickson, Ephemerella subvaria, mayfly that hatches in mid-April here in New Jersey. There is something very special to me about tying and fishing these patterns that I can only describe as being akin to eating comfort food - everything in life just seems balanced and peaceful. Very nice! 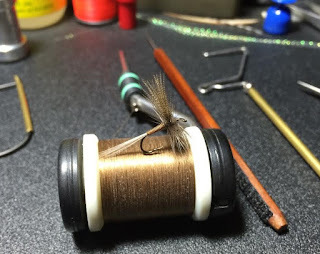 BTW Do you fish the traditional Catskill Fly patterns? Unstructured Time - We Fished!